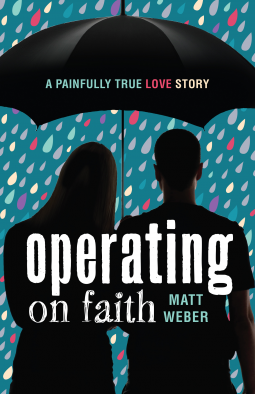 “A Painfully True Love Story” is the subtitle of this book, and boy – it’s not kidding around. The Webers sure went through a lot their first year of marriage. I appreciate Mr. Weber writing this book. So many memoirs out there focus on the struggles and triumphs of the author only – and while there’s nothing wrong with those works, this book brings something new by focusing so much on his wife, making what THEY are going through the central theme. A better book on how to forge a marriage together would be hard to find. No, the Webers aren’t perfect, but they are great role-models in how they actively put each other first, help each other through the hard days, and show grace for each other’s mistakes. The story in these pages will remind you to slow down a moment and savor the time you have with others – making each interaction count. I recommend this book as good training for all who want to make their own relationships stronger. Mileva Maric – a name I’ll not soon forget! She is definitely someone to research further, someone for scientists and thinkers today to learn from. 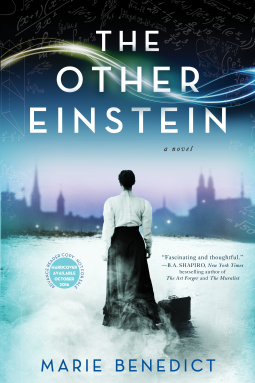 Mileva was Albert Einstein’s first wife, and through Ms. Benedict’s eyes, we get a glimpse of what their life might have been. This is a very precarious task, as with all historical fiction, for author and reader must be careful not to override or twist the reality they are building from. Ms. Benedict does a fantastic job of creating the time period in which the two would have met – the depth of research and care for her subject is evident! As a highly intelligent woman who fought for every inch of learning she could achieve, it is a shame students don’t learn about Mileva and her work like they do Albert’s, or even other noted women scientists throughout history. She is definitely a role model for pushing yourself to your highest potential, and never letting the nay-sayers get in the way of your goal. A very interesting read that makes the reader want to dig deeper! An interesting book! For fans of BBC’s new “modern” Sherlock series, this is one to check out! 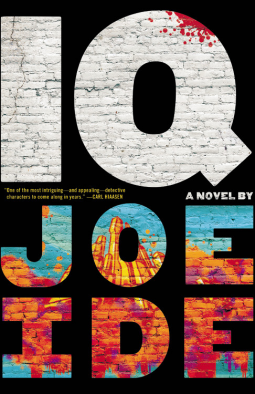 The similarities between these two stories are most on display in one of my favorite scenes in the book – when IQ goes through the process of learning to see. For those who do not possess a natural eidetic memory, learning to absorb and process a lot of information quickly and accurately is something that takes much focus and practice. We see the end results in Sherlock’s “mind palace”, or, closer to reality, the training of law enforcement officers, but not a lot is ever really said about the process. Sitting with IQ on the edge of the road while he learns this skill is written well, the reader feeling IQ’s frustration and sharing his eventual triumph. The author’s style in this work adds to the overall atmosphere, keeping IQ and the reader working to stay a step ahead. The narrative is told through sets of flashbacks, flash-forwards, and different points of view on same scene – the plot doubling back, twisting and turning on itself. This creates a moving, restless pace for the reader, with a unique tone while the story moves forward. One thing to note, there is a lot of rough language throughout the book. This work is different from normal mystery/thrillers I pick up, but definitely worth a read! I was gifted “The Door”, as I am a huge fan of allegory. This book first came out in 2013, and is now part of a vast series. I grew up on “The Chronicles of Narnia”, “Pilgrim’s Progress”, and “Hind’s Feet on High Places”. These works were the basis of my reader’s identity, creating within me a love for layers of meaning and deeper truths. “The Door” reminds me of those works, with its artful allegorical tale. The author definitely knows her genre, as I see similarities to other works, but she has taken the examples that have come before, and made them her own. The best part of this work, for me, was the strong, clear, Gospel message! As the main character, Shale, is dealing with many deep issues of anger and abandonment, the way she comes to understand her true worth, and believe in the King is written exceptionally. I would highly recommend this for others who have young people dealing with these issues. I would also recommend this as a fun read during bedtime stories, perhaps a chapter a night. A great way to get younger kids into larger books and series.